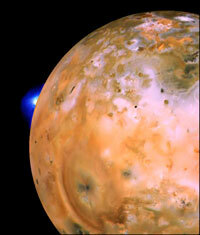 Io (pronounced EYE-oh) is the most volcanically active body in our solar system. At a little bit larger then Earth’s Moon, Io is the third largest moon of the planet Jupiter. Discovered in 1610 by Galileo Galilei, the four Galilean moons (Io, Europa, Ganymede and Callisto) were the first moons outside of our Earth Moon to be observed around a planet. Galileo named the four moons after mythological lovers of Zeus, the Greek equivalent of Jupiter. When the Voyager spacecrafts journeyed past Jupiter in 1979 they sent back amazing photographs documenting the volcanic surface of Io. Prior to this discovery, volcanic activity within our solar system had only been observed on Earth. Since that discovery it has been determined that the surface of Io is covered by sulfur in different colorful forms and that the volcanoes are driven by hot silicate magma. Jupiter’s immense gravity causes “tides” on the surface of Io and subsequent images of the moon show a surface that is considerably different from that first observed. Alice io was named by her father, who has a love of astronomy and interesting names. And although Io is a proper noun, Alice io chooses to write it lower case to eliminate confusion with the letter “L” or “J” in many typefaces. Growing up in Vermont, Alice io had lots of time to draw and color on cold, snowy winter days and has stacks of old drawing pads to show for it. She took any and all art classes she could throughout school and had the good fortune to grow up in a community with many professional artists who took the time to show her their techniques and styles. 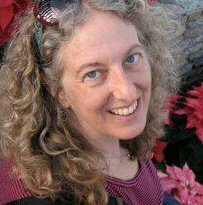 Alice io now lives in Asheville, North Carolina where she runs io design & illustration, inc., a full-service graphic and web design studio where illustration is an integral part of many projects. A new division of her company, moon io media, is beginning the adventure of developing eBooks, Apps and electronic publications. However, her drawing table, pencils, markers, inks and craft materials are still a major part of her creative days. One of Alice io’s favorite crafting activities is knitting, and she has dabbled with crochet, but she is currently spending more time quilting. After enjoying sewing for many years, Alice io became enamored with quilting when her mother gifted her a quilt kit. Not content with the design instructions that came with the kit, Alice io reworked the design and loved the whole process, creating the Sunset Quilt as her first large quilt. Since then, she has enjoyed designing and creating quilts for friends and family.